Hi there! My name is Margie, from Bumbles and Fairy-Tales. I'm so happy and honored to be a guest at the Bucket List today for their Fallen Discussion event - thank you, Gina! I am a huge fan and follower of the Fallen series by Lauren Kate. Here is my review to Fallen, the first book to the series. At the very start of the story we get a peek of a couple, where one is trying to stay away from the other and the other is trying just as hard to be with that one... but I'll come back to the first chapter in a bit. Luce Price has arrives at Sword & Cross, a reform school for troublesome teens, and instantly knows that this school isn't like any other school, reform or not, this is a school that she could never have imagined existing. Such a dark, unwelcoming and prison-like place, where contact with the outside world is only allowed in 5 minute weekly phone calls, their uniform is to wear all black and there are security cameras everywhere to monitor your every move. Everything seems hopeless and depressing to Luce until she sees Daniel. The moment her eyes land on Daniel, she is instantly drawn to him and wants to run to him, but why the instant connection? Why does Daniel seem so familiar and comforting to her... and when Daniel wants nothing to do with her and goes out of his way to make sure that she knows he has no interest it only increases Luce's curiosity to find out why he pushes her away and what secrets Daniel may be hiding. The mystery surrounding Luce and Daniel's pasts is consuming. A page-turner right from the start. We meet other students, Luce's new friends, Daniel's old friends, and at first I just wanted to dismiss them and wished that the story would just concentrate on their relationship. But as time goes on, these other characters play major roles in both of their lives. Not one person can be dismissed nor forgotten. Little by little, we find out why Luce was sent to Sword & Cross, what she can see, what her story is. We also find out why Daniel is so desperate to stay away from Luce. Daniel's story is heart breaking and you cannot help fall for for Daniel and want to hug him too. In the end, we finally hear the whole story that connects Daniel and Luce together... forever! because true love cannot be denied! I did find that the book was a bit choppy at times because it doesn't go into great details that I would have liked to have seen. But it doesn't keep the story from flowing. We are learning and experiencing everything as Luce is and I really liked that the author followed through with that. Now, let's get back to that first chapter! It's titled, In The Beginning and takes place in England, 1854. There are no names, the characters are referred to as "He" and "She". She is drawn to him everyday. He tries to stay away, but has a hard time doing so. He comforts himself by drawing pictures of her, it's obvious that he cares for her deeply. She doesn't know how or why, but she knows that she loves him and wants to be with him and makes it impossible for him to not cave in to her. And then he doesn't... They have their moment and we are left with a huge, oh my god! What just happened?! and of course, you need to know why. I really loved how the first chapter just draws you in by giving us a sort of tease... I have a huge soft spot for forbidden love. 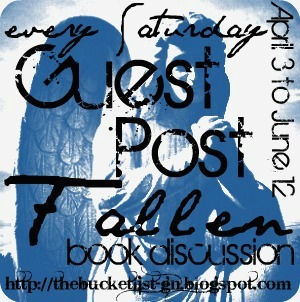 You have just had the lovely time reading Margie's guest post for my Fallen Book Discussion. Loved her critique on Fallen and some of the characters. You can check her out HERE. 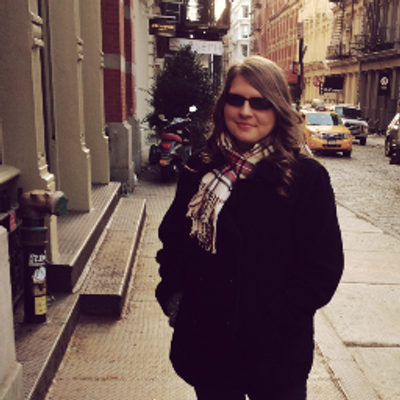 Have you written something about Fallen by Lauren Kate? I would love to see it mentioned in the comments! Thank you, Margie, for joining us today! If anyone else is interested in guest posting something about the Fallen series, please fill out this form HERE. Hope you all have a wonderful weekend! On Monday, I will bringing you my dream cast for the Fallen movie. Grab a copy of Fallen, some snacks, and stay tuned!